Straight port designed for a better fit for longer models and in precision honed ports. 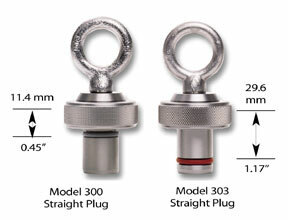 While the Model 303 has the same body dimensions as the Model 300, the o-ring on the Model 303 is further forward, providing a better fit in longer ports. The length is 29.6 mm from the inside flange to the top of the o-ring groove.